Originally started at the request of female students our kickboxing group is supported by our community partner Onyx Fit, based in Success. These kickboxing girls train 1/wk in the art of freestyle kickboxing. This is a fully graded program that can teach the students both passive and more aggressive self defence techniques. We also teach how to stay safe in unknown houses along with techniques on how to read groups of people and negative behaviors that may be dangerous. This program is aimed at also increasing self esteem as well as providing an avenue of exercise to transfer negative energy in a healthy way. After a long break from kick boxing, Dave was asked to teach the girls at Sowilo some skills from eons ago! Checking the memory bank and wondering if he could still kick whilst standing....he found that it wasn't too hard to get back in the swing of things. 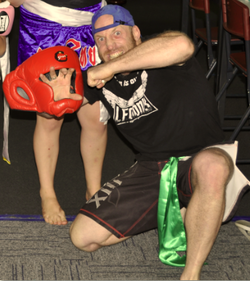 Dave did kickboxing for 2 1/2 years achieving what is called an intermediate level. Whilst there are no ranks in most kick boxing styles, I guess you could say he got a fair way through without getting knocked about too much!! He has never fought in competition and probably never will, but with the aid of certified Thai kick boxing trainer Jay Gray from Onyx fit and Daves Blue belt level in BJJ, Dave gets the group to a level where they can defend attack and escape on their feet and on the ground! The group will also learning some valuable party safe techniques in reading body language and group behavior, coupled with the training behind reading a room for exits and dangerous people.